The Breakers, one of North America's most legendary resorts, shines as a timeless classic on the shores of Palm Beach, Florida. Here groups enjoy everything under the Florida sun thanks to the resort's 140 acres of amenities, ranging from 36 holes of championship golf to a Mediterranean-style beach club reminiscent of St Tropez. At the same time, five-diamond service promises flawless events in a casually elegant beachfront setting. When it's time to convene, the Venetian and Mediterranean Ballrooms lend a sense of historic glamour to meetings and celebrations while providing all the conveniences of modern technology. The oceanfront conference center revolves around the state-of-the-art Ponce de Leon ballroom, featuring versatile prefunction and outdoor spaces. Altogether, more than 22 venues make up the meeting room collection, all supported by cutting-edge and customer-focused conference, production, and audiovisual teams. The incentive power of any Palm Beach getaway draws much of its pull from the south Florida sun and balmy ocean breeze. Today's Breakers complements these natural assets with 540 recently renovated rooms and suites, a rejuvenating spa, beach club with private beach, 20 bungalows and 10 cabanas, plus five pools and four whirlpools. Yet above all else, The Breakers earns its reputation as a premier group destination thanks to a tenured team of professionals who ensures that every guest enjoys an unsurpassed experience. An experience at The Breakers is, for the sophisticated traveler, the quintessential fusion of timeless charm and gracious service with distinctively modern comforts. Historic, beautiful & first class service - it's an ideal property for an incentive. Their CS staff seems to be spread a little thin at times, but their attitude and willingness to make it better goes a long way toward erasing any frustration. We canceled one program and rebooked the following year and our team will never forget how professional their management team was and how hard they tried to work with us to limit liability. They even sent a REFUND of our cancellation fees when they were able to resell rooms our group would have occupied. We will never forget that and will always be loyal to the property when it's a fit for our groups. My program at The Breakers was hands down the best program I've worked on. The staff have meetings down to a science - which made for a very smooth program. The only problem we had was the bar closed rather early - 11pm. There were over 70 patrons in the bar and they refused to stay open...too bad, that would have been a nice bit of revenue. Each guest feels like they have been elevated to celebrity status at The Breakers. Service is key, and they don't fail to deliver. If you are considering The Breakers...don't wait! Go now! Love this property!!!! We did an 700 person executive event there and not only was the property GORGEOUS, the staff was AMAZING! You can tell that all the employees (from our sales person and our conference planner all the way to the valets) took pride at being at The Breakers. This property and staff did an amazing job with our conference and I can't wait to do another program there!!!! 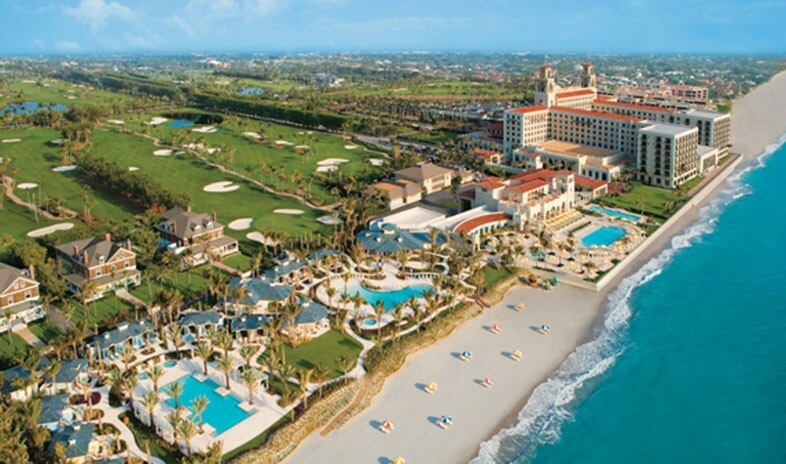 PALM BEACH, FL – The spirit of ongoing renewal is relentless at The Breakers Palm Beach, a spectacular, luxury beachfront resort with a bounty of outstanding amenities. Its dedicated family ownership (heirs of founder Henry Flagler, c. 1896) invests a minimum of $25 million each year in capital improvements — an unrivaled financial commitment for one hotel — so The Breakers may continually evolve in harmony with guests’ elevated preferences and deliver an ever-improving experience. •	Dedicated Flagler Club staff — 19 team members (including General Manager and 3 Assistant Hotel Managers) exclusive to this 25-room hotel. They are exceptionally intuitive and discreet, committed to utmost guest fulfillment, personalization and privacy. Flagler Club staff’s combined years of service at The Breakers: 112 years. A dramatic $8 million full-scale renovation has transformed Palm Beach’s coveted destination for personal renewal. The new indoor/outdoor spa evokes The Breakers’ seaside sophistication and Italian influence with a calming, modern style envisioned by internationally renowned designer Sylvia Sepielli (U.K.’s Spa Village Bath at Gainsborough Bath Spa, Dolder Spa in Zurich). The stunning, contemporary aesthetic features clean lines, artisan elements and a soothing canvas of elegant shades of white; the four elements of ocean, touch, botanicals and tradition add inspiration. The theme “held in our hands” expresses The Spa’s commitment to nurturing and healing each guest with heightened comfort and care, manifest by expertly-trained, intuitive staff and their warm, genuine service. Just over a year ago, Ocean Fitness debuted as The Breakers’ flagship fitness experience — a spectacular, 6,000-square-foot, indoor/outdoor oceanfront fitness facility situated in the resort’s Mediterranean-style Beach Club complex. Complimentary to hotel guests, this exclusive amenity provides an amazing array of resources to help individuals reach their personal fitness goals, in an inspiring setting with breathtaking views of the Atlantic Ocean. Each year in June, The Breakers’ Wine Director & Master Sommelier, Virginia Philip, and several colleagues travel to France on an annual wine-blending journey, to customize the finest proprietary blends of house wines exclusive to The Breakers. Launched in 2003, this yearly program was born from Philip’s passion to elevate the caliber of house wines, and supported by an extraordinary labor of time, talent and resources. The Breakers debuted its first custom-blended house wines in 2004, and they have been re-blended annually ever since. In 2014, a new partnership began with Mas la Chevaliere, a vineyard in the Languadoc region of the South of France near Béziers. Virginia and her fellow team members burrow in the winery’s tasting room to blend and re-blend each variation of wine until the house wines are absolutely perfect. The Breakers’ four house varietals — Chardonnay, Sauvignon Blanc, Pinot Noir and Cabernet Sauvignon — are poured at its eight restaurants, eight bars, in-room dining, and served at hundreds of premium banquet events. In all, 40,000 custom-crush bottles are opened each year.